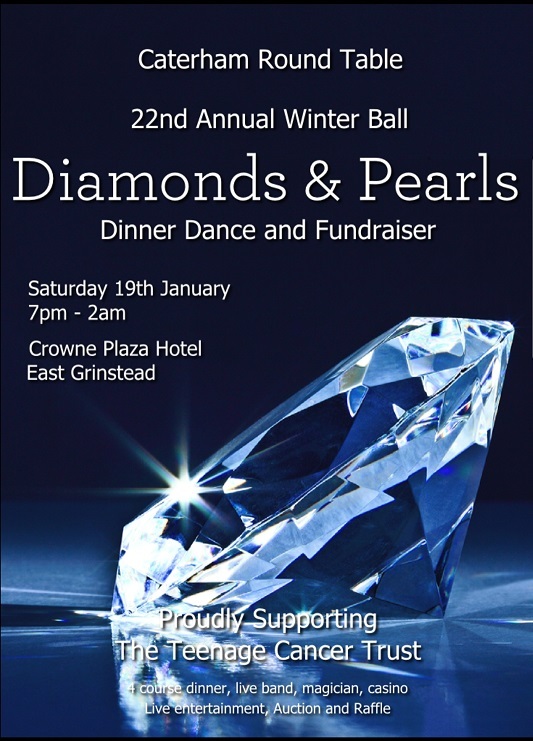 Caterham Round Table are excited to announce the 22nd Annual Winter Ball on Saturday 19th January 2019. 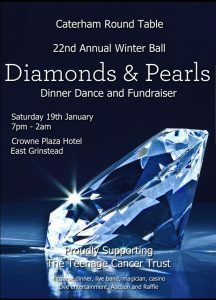 Dazzle with diamonds and drape yourself with pearls for the sparkles of a “Diamond & Pearls” themed evening. With a scrumptious 3 course meal, a live band – Mr McIntosh, the fabulous Andrew Kelly table magician, live entertainment and a casino – what better way to light up a cold and dreary January evening? 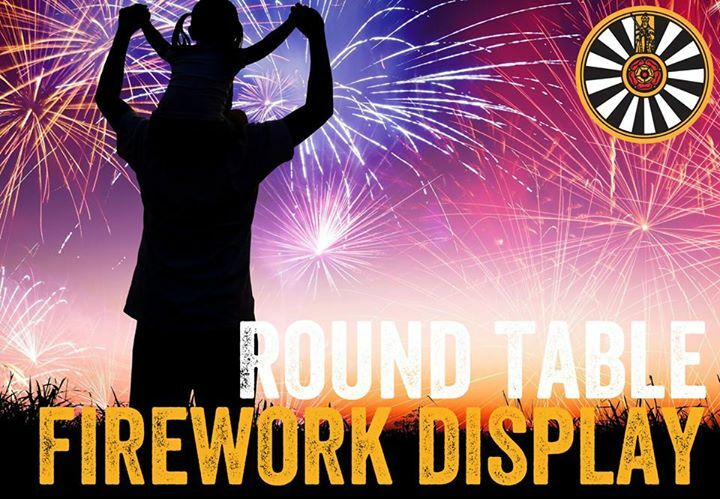 Bigger and better than ever, don’t miss the Caterham and District Round Table annual bonfire and firework display on Saturday 3rd November! It’s a great evening out for all the family. Tickets are available from early October – at a discounted £5 each. Buy at local outlets, or online – click here for details. “Be smart. Pre-purchase your tickets today”. Gates to the field open at 6pm, with the evening kicking off with a torchlight procession leaving from Westway Library at 6.30pm. Don’t forget to get to the library early to buy a torch! The fire will be lit and the display from 7.15pm and there’ll be plenty of hot food, mulled wine and beer on offer. As with all Round Table events, all proceeds go to local charities in your community. See our Where Your Money Goes page to find out more. Buy Tickets [Available from early October] – at a discounted £5 each. Buy online or locally – click here for details. Tickets allow you to use the ‘Ticket-only-gate’, to avoid those long lines. or visit Computer Solutions on High Street, Caterham on the Hill. Fancy making your own Fawkes? Our Build a Guy competition has cash prizes for the winner and runners up and free tickets for the winners. 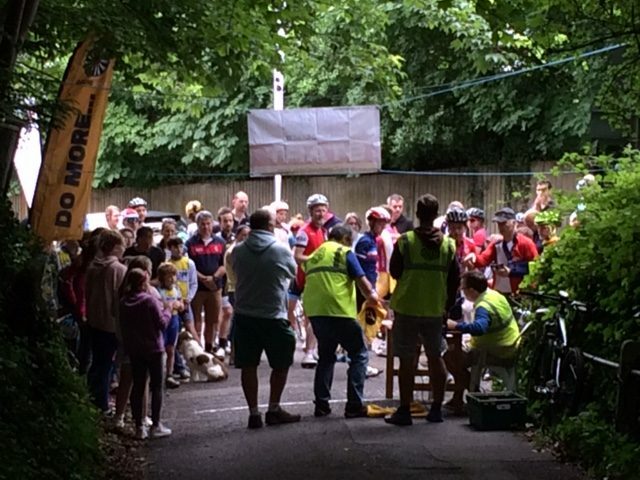 All entries must be delivered to Dene field Caterham by 10.30am on the day of the event. The 8th annual Waller Pain hill climb returns to Caterham on Sunday 17th June 2018 at 10am! 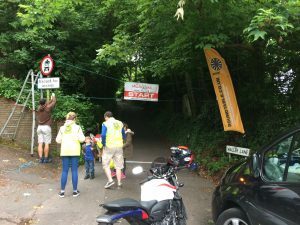 Waller Lane is a narrow road running from the centre of the Surrey town that pitches up at 20 per cent in places, and includes 210 feet of climbing over its 0.31-mile length. 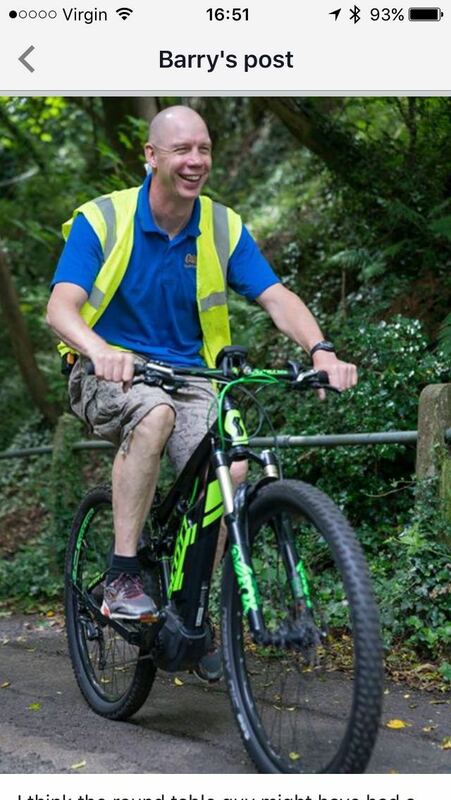 The all inclusive event attracts an unusual mix of Elite riders including National Hill Climb Champions, enthusiastic club amateurs, have-a-go Mum’s on shopping bikes all the way down to kids on balance bikes (supported by strong backed Mums and Dads). The emphasis is firmly on having some fun and the event is part of the annual Caterham Festival, so there’s always a sizeable crowd cheering on the riders. 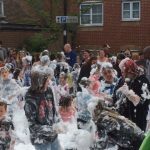 Proceeds from the event will go to the Caterham Round Table Charitable Trust, to support local charities. • First rider sets off at 10am so please arrive for 9am-9:30am (latest) to allow time to get your number and register. Live-video feed on a screen at the Start-Point, so see the riders cross the finish. Also available on Twitter-Periscope. An event photographer is being arranged, to capture and share your achievement. 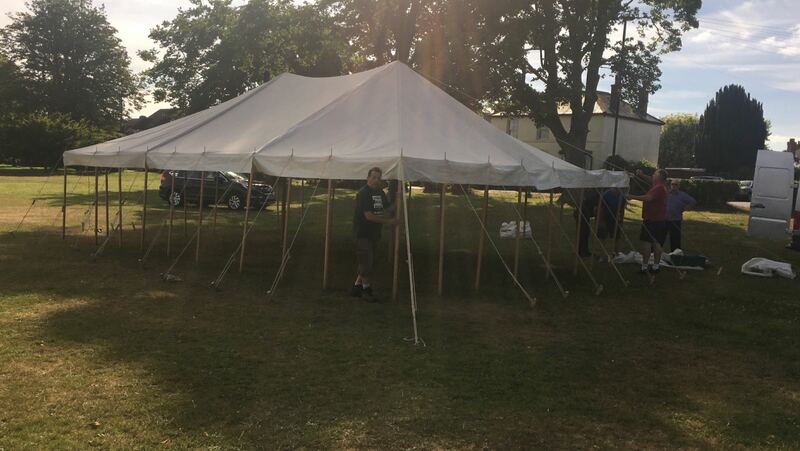 The answer “help us put up a beer festival tent and we’ll make it worth your while”. 3 were instantly available. The task… One small marquee. Childs play we say. The 3 became just 2 with; Haydn and Rupert, on their way into their nearby office of South Anston Building & Property maintenance nailed it! Well done lads and we’ll keep the banter on WhatsApp, about the 1 drop out to ourselves. 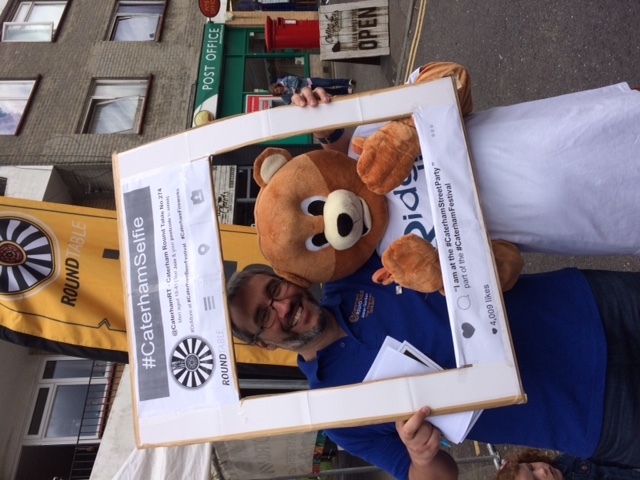 Thanks to a little gesture, the Caterham Festival’s last night of the proms, Caterham Games, beer & prosecco festival was a success. I’m sure Haydn and Rupert were compensated in some way. Are you up for it ? Why not find out what Round Table is all about. We are the largest club for young men aged 18-45 in the world. Just get in touch in our contact-Caterham-Table-page, we’ll do the rest. About 10 times a year, we do a business meeting, meal with a speaker of random topics. Folk think we sit in formal lounge suits but think again people! We’re casual, with jeans and a blue rugby the typical order of dress. One individual, we have yet to see him in anything but shorts, even on the coldest of nights. This meet we skipped the speaker as we wanted to get the inductions done of 2 new members in order to retire to the bar for a social welcome drink. That way, with formalities aside, we socially welcome Andy and Gareth. Andy was introduced via spouses who work together who came along as an invited guest, to a members and partners night, he just kept coming and is now well into the social scene. Welcome, Andy. Gareth was a dormant contact on Russ’ NCT group phone list. Years on, now that the kids a bit older he is embracing the local lad social aspect very, very well. 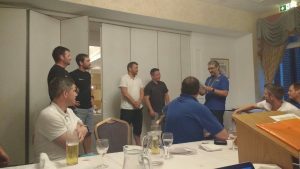 He’s a popular carpool member having access to 7-seater, but tonight he was a passenger – he received our welcome-quarter-yard of ale and as any Welshman, the beer disappeared in one. Welcome, Gareth. If you are interested in seeing what Round Table is all about for yourself. Our doors are open. BBC Radio Surrey have been doing an ‘in your town’ this month. 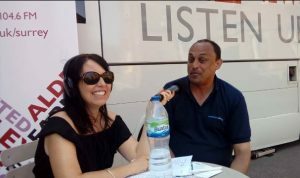 Visiting Caterham in their tour bus for a day, Glenn took time out form his duties at Computer Solutions and Andy Parr, the chairman of Caterham Festival did a great piece with the presenter. 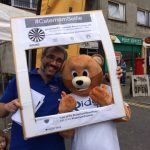 Glen, covered how great he finds being involved with Caterham Round Table and other groups in the area. 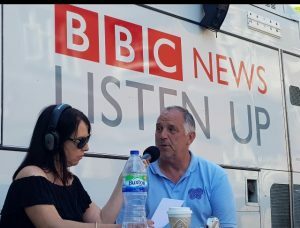 A master stroke was that they were in the outside the Soper Hall, so managed to do a 2-minute shameless plug for the Caterham Beer festival, returning again this year on 17th and 18th November. Thanks Glen! We will see you at the Beer Festival in November. Andy was interviewed about the Soper Hall, the Caterham Festival and its events, with a great plug for the successful ‘Waller Pain’ cycle hill climb and the Ghost Walk, that the Caterham Round Table laid on. Thanks Andy! Are you Interested in seeing what Round Table is all about ? 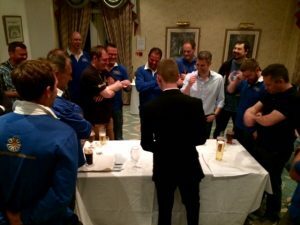 So the Caterham Festival’s most popular event was on again, and Caterham Round Table lads get stuck in. 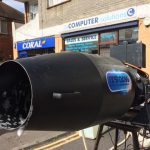 The Street Party on Caterham on the Hill, sees all three shopping streets closed to traffic, with music stages and entertainment. 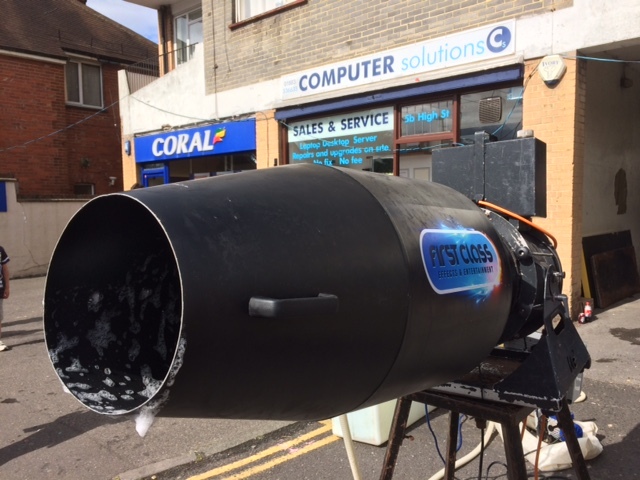 The Sun was shining, and Caterham Round Table decided to borrow a candy floss machine. The business model is always flawed as most of the Tabler’s kids were keen to learn how to use it, then make more floss for themselves, while we chat and enjoy a beverage. Never mind. 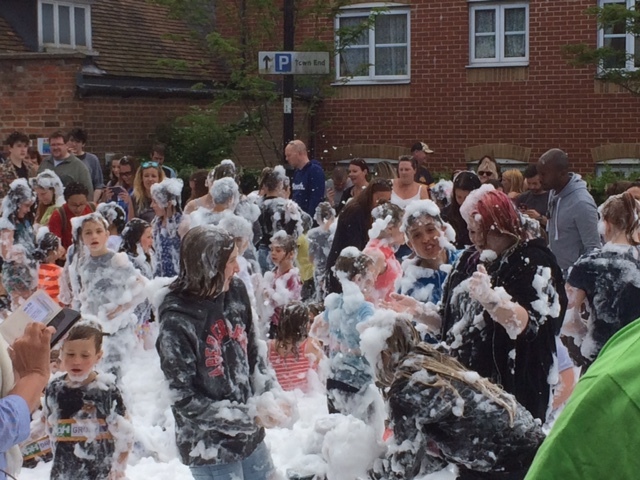 5pm is Round Table’s time-to-shine when it is “Street foam” time. 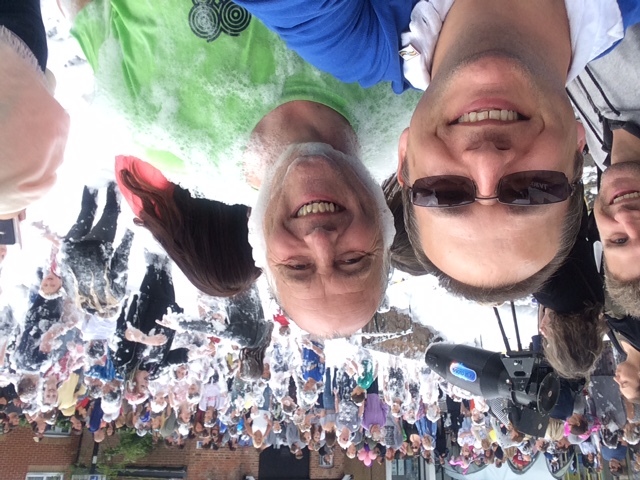 Night clubs are small fry, cos we fill the whole street with foam. Boom! All possible as Tabler Glen, who runs the Computer Solutions shop in the High Street, gives us access to their power supply and mains water. The photos speak for themselves. Cheers Glen! Interested in seeing what Round Table is all about? 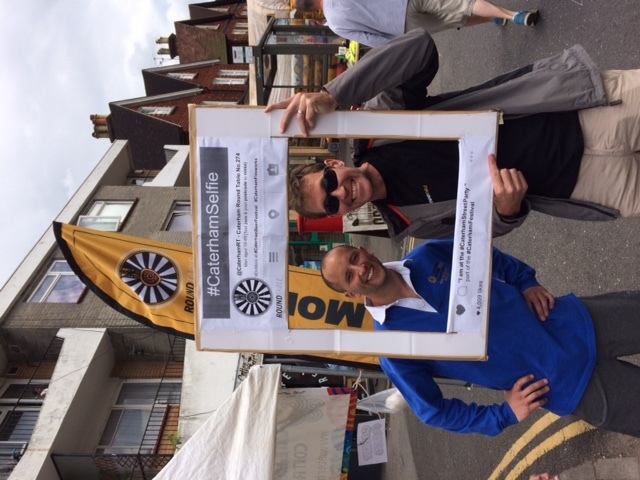 The Round Table lads of Caterham offer to host a sports event for the Caterham Festival. 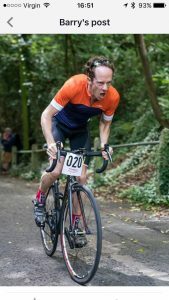 As Caterham is blessed, or cursed with many steep hills, the Waller Lane has been in the cycling world in ages gone past. The Waller Lane is suitably nick named “Waller Pain”, so the event and the website carry that name. The reason we picked the cycle hill climb is lost in history, maybe it’s because we like to see people in pain. That seems right, so we’ll stop the research there. How do you run a hill climb? Well, it is easier than the Tour-de-France and takes up 1 morning. We have one or two organised individuals do all the prep, then the rest of us all turn up and take a role on the day. Be it a timekeeper, commentator, generator-kicker, brew-runner or registration desk. Most lads are not lively on a Sunday morning, so lazily task their kids with the mundane stuff and drink coffee instead. 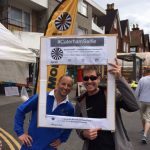 Larner’s cycles always help out with a with a toolkit and promote their July Caterham-to-Canterbury ride. The lead organiser took a liking to Larner’s demonstrator- Electric mountain bike and hammered half the remaining charge, gliding up the hill effortlessly. So, 39 riders registered online and an extra 10 turned up on the day. So we cheered all the 49 riders each minute they ascended. Tallied the results and dished out prizes. The results are on the web page, with the course record was broken this year. It may not be a great event to recruit any new Round Table members, but hey, we’d look no better in lycra either. Our doors are open, especially on our open-night. As part of the Caterham Festival, we open the doors of Caterham Round Table. Anyone interested in Round Table can turn up, we lay on a buffet, some entertainment and buy drinks for anyone who turns up. So, not all bad. The 12 active members hosted the four newcomers. Plus, ten old-timers who turn up at the mere sniff of free food and drink. The buffet was plentiful, the Coulsdon Manor Hotel bar was accommodating, and the entertainment was awesome. Andrew Kelly, the close-up magician, can put Dynamo to shame and never fails to impress and baffle the lads. OK, great news that we raised £105 from the participants of this year’s Monopoly Pub Crawl. Every one got home intact. Anyways…. 21 brave souls, set out to play the Monopoly board for real, yep a drink in each pub on every street on the Monopoly board. A 10 am start as soon as the first pub opens doors. Those who think ‘a pint in each pub, seems simple‘ are quickly briefed by the veterans of previous years, who imparted their wisdom. To limit yourself to half-pints in each as time is tight, choosing soft drinks in some (or most). Also to skip the stations as you will need to make time to stop for food, travel between locations and of course, bladder stops. Oh’… and avoid jail. We started in Old Kent Road, then into Whitechapel, Kings Cross, Angel for a full breakfast, then more central into Pall Mall and Whitehall. As the wisdom diminishes among the-few. The-many, have the issued instruction booklet with a turn-by-turn set of directions. All participants, are tagged like Paddington Bear himself, with a luggage tag with their home address and contact details – to refer to should the need arise. So why do we do it? Round Table is all about socialising with a purpose, whilst we see some of the sights of London. A great example, was a Hotel that used to be a Court house, still with the holding cells as booths and the court room as a restaurant. Awesome ! The winner of the night are the wise. Those who know when to depart, those who can pace themselves and keep the walking pace up. But it is not about who makes it to the end, it is all about participating and getting home safe and well. The big beneficiaries are is the Breck Foundation who will receive the £105 donations, £5 from each participant. The Breck Foundation is a great local charity with national ambitions and have the meaningful hashtag #PlayVirtualLiveReal. Each February teenagers get to participate in a 24 Cycber-Silence called “Not Tech for Breck” . Where participants of all ages post go without all tech. This can be done at anytime, during the ten day period – ending on 17th February, the anniversary of Breck’s passing. Want to know more about the Breck Foundation and their work – go see their website. Maybe buy some merchandise or the DVD of the BBC Documentary.